NEW YORK, April 6, 2018 /PRNewswire/ -- Two seniors from Wallenpaupack Area High School in Hawley, Pennsylvania finished in 1st place at the 2018 National Automotive Technology Competition. The students, Evan Sennefelder and Andrew Stuart, who can now call themselves 'America's Top Technicians', were sponsored by the Pennsylvania Automotive Association after beating out 28 other teams from across the country to win the national competition. National Automotive Technology Competition Winners Andrew Stuart (left) and Evan Sennefelder under the hood at the 2018 National Automotive Technology Competition. 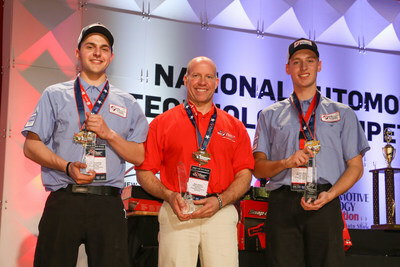 America's Top Technicians: High school students Evan Sennefelder (left) and Andrew Stuart with their instructor Mark Watson of Wallenpaupack Area High School, Hawley Pennsylvania. "These are the technicians who will service and repair your future autonomous car," said Mark Schienberg, president of the Greater New York Automobile Dealers Association, which organizes and sponsors the annual event. "The young men and women in this Competition have shown that they have an extraordinary ability to combine highly technical knowhow with problem solving abilities. We need these highly motivated and talented young people in dealerships across the country to make sure vehicle owners have access to technicians with the best computer and technical skills," he continued. The National Automotive Technology Competition, which is the auto industry's largest school-to-work initiative, pits the nation's best high school automotive technology students against each other for the title. The National Competition culminates with a 3-hour, under-the-hood component where students diagnose and repair automobiles that are rigged with a variety of malfunctions. From 1993 to today, the National Automotive Technology Competition has brought the nation's best high school automotive technicians to test their skills, measure their knowledge, and challenge their ability to diagnose and repair vehicles. The National Finals, held in New York in conjunction with the New York International Automobile Show, are possible thanks to the generous contributions of over 100 industry sponsors including automakers, industry organizations, OEM suppliers, educational institutions, and dealer associations from across the country. This year, prizes and scholarships totaling more than $3 million were awarded to the participants. Snap-on, the Competition's Official Tool Supplier, provided tool sets to all competitors. "High quality vocational training is a critical part of our Nation's education needs and this Competition is designed to encourage more rigorous standards for vocational education to ensure students master the skills they need to succeed as lifelong learners, workers and citizens," continued Schienberg. The rules of the contest are simple. Each team of students is assigned an automobile that is rigged to malfunction in a number of ways. Using a repair order with actual customer complaints, the student teams must diagnose and repair the problem within the allotted time, using the manufacturer's specialty tools. Each "bug" correctly diagnosed and repaired is worth a number of points, depending on the level of difficulty. In addition, the students' knowledge of emissions control systems, alignment, electrical test equipment, airbag components, oscilloscope usage and mechanical measurement equipment is tested during a series of intensive work station sessions. To prepare for the competition, students are trained at local new car dealerships and the skills they learn from master technicians prepare them to succeed in the working world. The Greater New York Automobile Dealers Association (GNYADA) represents more than 400 franchised automobile dealerships in the metro New York area, who are collectively one of the area's largest economic engines. Generating billions in economic impact and supporting more nearly 60,000 jobs, the Association is an advocate for dealers and works to protect consumer rights. It also promotes on-going education and training and creates job opportunities for young people interested in pursuing careers in the automotive business. GNYADA owns and operates the Center for Automotive Education & Training, and the New York International Automobile Show. The Association opened its doors in 1910 and has continued to serve the needs of the industry ever since. GNYADA.com.